Shows you the charging speeds of your device, gives most vital specs - all in one place. It gives you the information that no other app can! After release of iOS 10, all advanced battery related information was removed from the developer access. As a result, all apps that could show the charging rates of the device, and any other battery related information lost that functionality. After trying to find a way to get this information on iOS 10 and above, we finally found it! Amperes - battery charge info bases its calculations an a few still available data from Apple. In particular, we know when the battery charged up 1% and we can also measure that time. Using electrical formulas, we manage to get amperage and wattage of the chargers. You can run a single test or non-stop test. Non-stop tests will constantly monitor and record a device’s charging. You can configure each test or configuration by specifying the charger type, wire type, or even your own custom settings. Once you are done testing, you can export the results in an easy to use table. As well, you will be able to check your results against a score comparison table. Make sure to read the instructions. The help section is the best place to start. That will teach you everything you need to know before starting your first tests. Easely choose the best charger for your device. You can see which charger and charging wire are actually the best for charging your device. Compare chargers, wires, wireless chargers or a combination of those components. You will be surprised how big of a difference one bad wire can make. 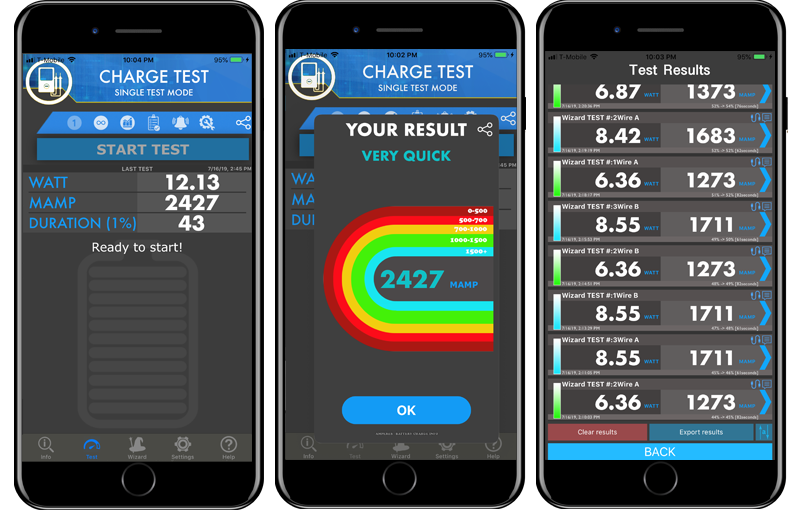 At this point of time, Amperes - battery charge info is available for download only from the Apple iTunes Store on your device.